MAB Celebrity Services invites you to spend “A Glorious Day with the Amazin’s” on Saturday, Nov. 14, at the Crowne Plaza Fairfield in Fairfield, New Jersey. 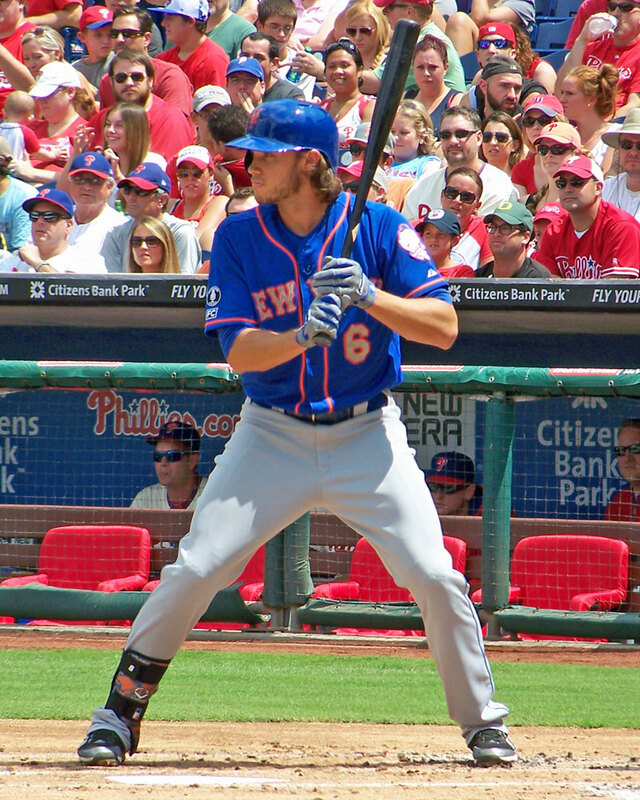 Twenty-two current and former New York Mets will be guests at the autograph show, including members of four of the five Mets teams that played in the World Series. Highlights of the show include appearances by Travis d’Arnaud, Endy Chavez, Billy Wagner, Sid Fernandez, Dwight Gooden, Mookie Wilson and Jon Matlack, as well as non-Mets guests Ozzie Smith, Whitey Ford, Don Mattingly and Bill Buckner. Three former Mets players with World Series rings will be the headline guests of the convention – Mookie Wilson, Wally Backman and Ed Charles. Current Mets radio broadcaster Josh Lewin and New York’s best baseball mascot, Mr. Met, will also be there. Backman and Wilson will both be signing autographs for fans (free of charge with paid admission) and participating in panel discussions, while Charles is attending to accept the Gil Hodges Unforgettable Fire Award. Filmmaker Heather Quinlan will discuss the making of 86 Mets: The Movie, a film about baseball’s most beloved and hated team. There will be a presentation about legendary Mets broadcaster Lindsay Nelson, a Q&A panel with ESPN New York’s Adam Rubin, and a “State of the Mets” round table with bloggers and professional media members. The full panel schedule includes many other events. Tickets to the Queens Baseball Convention are $35 and are still available. If you’re going, please let me know what you think is the best part. 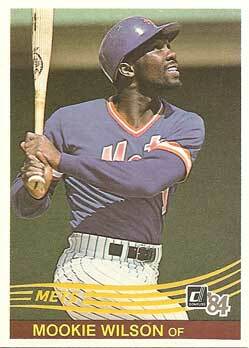 Yesterday we looked at the Mets cards in the 2014 Topps Update base set. Today it’s time to focus on the inserts. 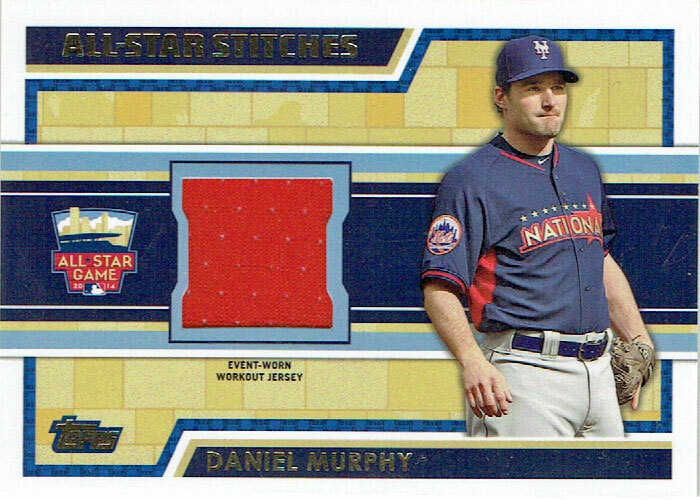 All-Star Stitches is my favorite long-standing insert found in Topps Update because it’s the last relic card that actually makes any kind of claim about what game or event that the relic it contains is from. 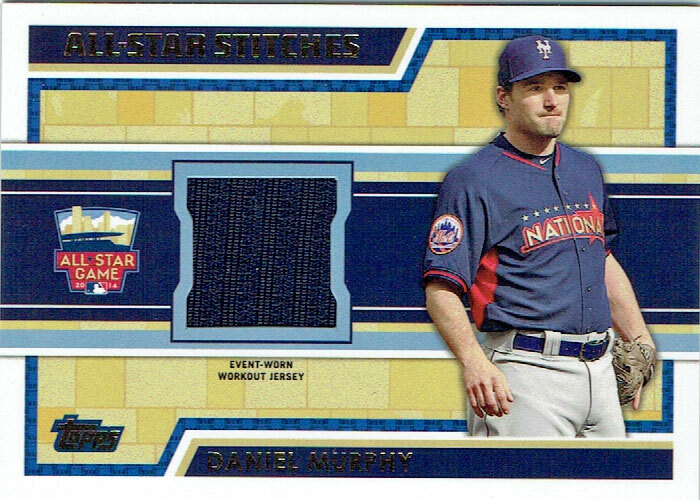 The Mets had one All-Star representative this year, and it was Daniel Murphy. There are versions of his card with red and blue jersey material swatches… since they were relatively inexpensive, I picked up one of each. 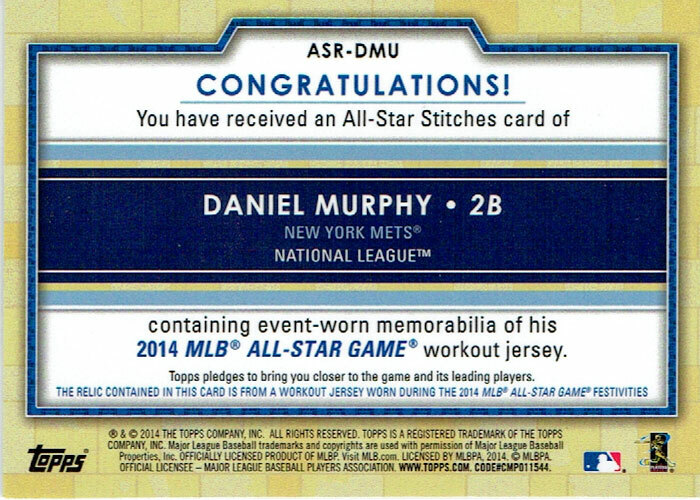 There are also a few more limited All-Star Stitches cards featuring Murphy: a gold parallel serial numbered to 50, a unique platinum parallel, a jumbo patch card serial numbered to 6, and a combo card featuring jersey swatches from both Murphy and Derek Jeter serial numbered to 25. 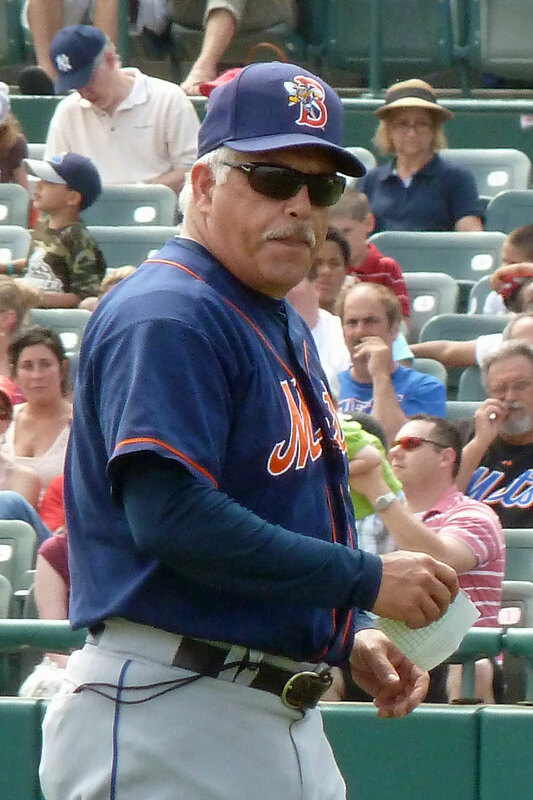 Two members of the 1986 World Series Champion New York Mets, fan favorites Mookie Wilson and Wally Backman, have been announced as guests at the 2015 Queens Baseball Convention on January 10 at McFadden’s Citi Field. Tickets are on sale now for $35 and include one autograph from each guest as admission to a variety of panels and other events. For more information, visit QueensBaseballConvention.com. This is the coolest re-enactment of the famous moment from Game Six of the 1986 World Series I’ve seen since somebody recreated it in Nintendo’s RBI Baseball video game. If you’re in Manhattan and can get free at lunchtime tomorrow, you could meet New York Mets fan favorites Mookie Wilson and Ron Swoboda at the CitiBank branch at 90 Park Avenue. For more details, check out Nick Diunte’s Examiner.com article.